karishma, 13 Nov 2012sumtyms my mobile blinks and then switchof automatically and sumtyms it freezes..pls tell me w... moreMine too hangs quickly. 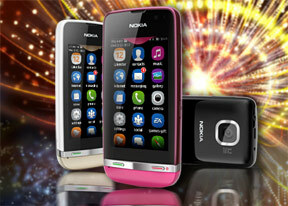 Anshu, 11 Nov 2012 After 2 months in my asha 311 , EA games & nokia store is not openingEA gift is only valid for 60 days. Before that you should have downloaded whatever you want. what it can read pdf or office?? when i play any vedio, it does not cover full screen. screen from both side keep blank. pls suggest. It is best ever phone with 3G and price is suitable. All the features are functioning very well. Practically, it is good to run a single task at a time so as to use best hardware and software acceleration and this is one of the best device in its class. Internet speed is very good as per expectations and I love my Nokia Asha 311. I am very choosy and after using it for a month I feel its worth to have such a nicely designed phone. excuse me, i want to know about the battery, is it a long lasting one or?? Hey guyz if you can leave 3g, wifi then choose N5233 its now available with a metal cover on sides like 2700 and it looks nice. you can get 3.2 inch 16 million colour screen, symbian s60 v5 OS, 2mp camera having nice and clear results. you can shoot videos in 360x640 in mp4 format that can view nice in pc even in TV (Usb supported dvd player + card,reader) choose 5233 or 500 (if you have little bit budget) thank you. its profile rename is not possible. why?